Even though on Tuesday most eyes will be on the top ticket race between Democrat Hillary Clinton and Republican Donald Trump, many are eager to see if the resurgent Dems can ride Clinton’s projected success — or, more accurately, Trump’s anticipated failure — to victory and recapture the U.S. Senate, which they lost control of in 2014. Things are looking good for the Democrats: they only need to pick up four seats to regain the majority — that is, assuming Clinton doesn’t lose. The Democrats are blessed with a favorable electoral map in 2016: of the 34 seats up for election this cycle, 24 are currently in GOP control. More importantly, though, with the exception of Nevada, all seats currently held by the Democrats are heavily favored to remain Democrat. Additionally, two seats currently held by Republicans, in Wisconsin and Illinois, are widely expected to flip. And because of an additional quirk of the Senate — that the Vice President provides the tie-breaking vote in case of a 50-50 split — if Clinton turns her current polling reality into electoral victory, the Democrats will have an additional advantage. Of the seven “toss-up” seats as categorized by RealClearPolitics, Democrats only need to pick up three to pull even with the Republicans; a Tim Kaine VP would then tip the balance of the chamber towards the Democrats. Of course, this is easier said than done. The toss-up seats that the Democrats need to pick up truly are toss-ups at this point, though according to FiveThirtyEight, the Dems still have an edge, with the forecasting site giving 2-to-1 odds for the Senate changing hands. Nevada: The seat being vacated by Senate Minority Leader Harry Reid is one of the tightest races this year. 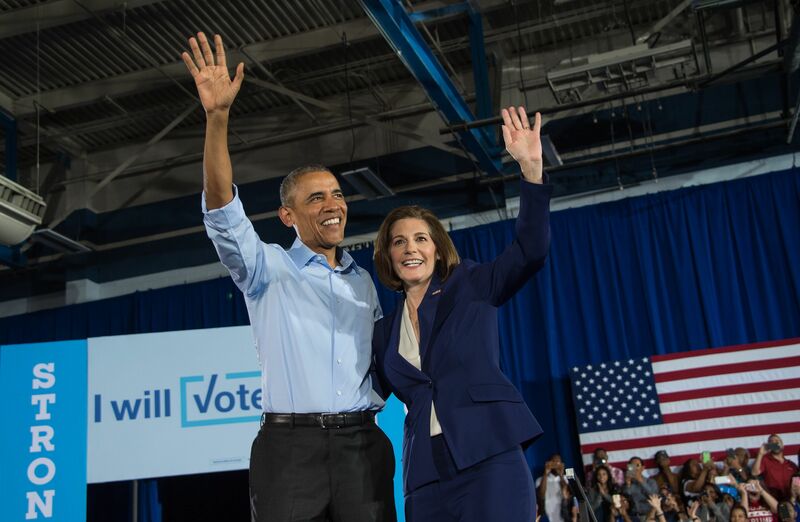 Republican Congressman Joe Heck is facing off against former Attorney General Catherine Cortes Masto, and many are expecting Nevada’s Hispanic population to play a pivotal role. Pennsylvania: Even though Clinton is performing comfortably in the Keystone State, Dem Senate candidate Katie McGinty is having trouble getting the same edge over incumbent Republican Sen. Pat Toomey. New Hampshire: Republican Sen. Kelly Ayotte is having a helluva time defending her seat from a challenge by current Gov. Maggie Hassan; Trump’s terrible record with women sure isn’t helping. Missouri: Even though the Show-Me State is tipping heavily towards Trump for president, Missouri’s Senate race has gotten weirdly competitive. FiveThirtyEight currently gives challenger Jason Kander a 57 percent chance of stealing the seat from incumbent Roy Blunt. Indiana: Former and perhaps future Sen. Evan Bayh, who retired from the Senate six years ago, is running for his old seat against Republican Todd Young, both hoping to grab it from retiring Republican Sen. Dan Coats. North Carolina and Kentucky: Both of these contests are for seats currently held by Republicans, and the GOP is favored to win in both by FiveThirtyEight (by 2-to-1 and 3-to-1 margins, respectively). But both are also in states with early-ish poll closing times, so if you’re looking for early signs of a Democratic tidal wave, these two Senate races will be key to watch. Regardless of how each of these races go, though, the good money is still on the Democrats to take back the Senate, especially if Clinton is triumphant.